Like the famous Italian city that inspired her name, the Florence Miche Luxe Collection design is architecturally beautiful and rich in detail. 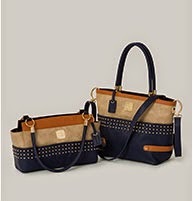 Lightly-textured tan faux leather with camel and deep navy accents provides a backdrop for rows of miniature rivets in classic gold. Florence also features two large wrap-around exterior pockets. Come è bello! As part of our MICHE Luxe Collection, Florence comes with matching handles, key fob and a dust cover for easy storage.